On CCTV, no-one can hear you scream. But technology from a UK company now means cameras can tell if you're being aggressive or calling for help - and will alert security guards straight away. Our system picks out the most salient characteristics. These are things related to pitch, tone, intonation. Cambridge firm Audio Analytic has produced software which it said can analyse the pitch, tone and intonation of noises and work out if they pose a threat. "A lot of incidents just can't be picked up by video only systems," said Chris Mitchell, Audio Analytic's boss, on BBC World Service's Digital Planet. 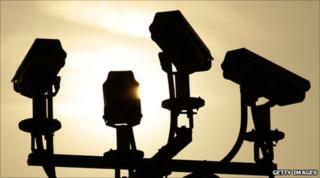 "For example in a hospital where somebody, or a nurse, is being threatened early hours in the morning - that's a very difficult thing for CCTV guards who monitor hundreds of channels worth of video signals on 20 screens or so to pick up." The software goes beyond simply placing microphones onto cameras and listening in. By feeding hundreds of sample sounds into the system, the software can distinguish different threats from various sounds - and not just based on volume. "We don't work with volume at all in the system because it's so related to how far somebody is from the microphone that it's not a useful metric. "Our system picks out the most salient characteristics. These are things related to pitch, tone, intonation." Essentially, Mr Mitchell explained, the software contains hundreds of audio fingerprints, and as soon as a sound resembles a stored sample, the alarm is raised. However, like any software early in its development, it does not always get it exactly right. "At a test site we did, someone got annoyed at the coffee cup machine because it swallowed their coffee cup money. "From our point of view that's a true positive - we really detected them getting genuinely aggressive at a coffee cup machine - but from the security point of view, it's not a genuine detection." These mishaps aside, the Mr Mitchell's team is confident the technology is ready to get out into the market. "The false positive rates you get out of a system like ours are very low. "Now, in security systems like a smoke detector we might have in our house, we know it has false positives - it goes off when you burn the toast. "A certain number of false positives are beneficial so long as you have the security bandwidth to cope with them because you'd rather know about things that you think were an incident than just miss things you failed to be alerted to."